If the 1950s was a Golden Age of science fiction, then the 1980s was the future its writers wrought, perhaps unintentionally and with far from perfect prescience, but unquestionably content to take credit once again for space shuttles, the growing power of computers, and a military program called “Star Wars”. One would be hard pressed to find a parable more perfectly responsive to increasingly rapid technological tectonic shifts than a remake of the “The Fly”. The question of whether matter transmission is safe is as moot in the 1980s as it was in the 1950s. 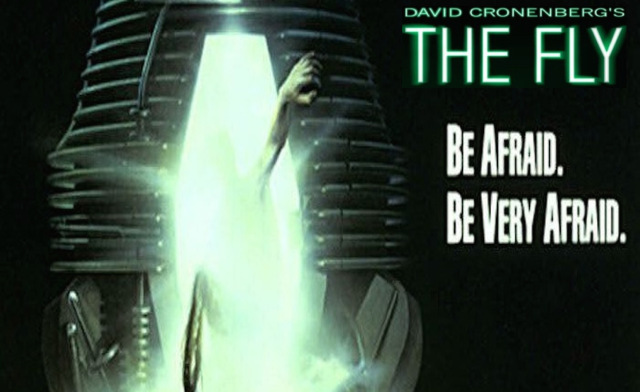 Notable body horror director David Cronenberg addresses this question again by updating “The Fly” for a very different audience while at the same time keeping its core concerns intact. Now set in America, Seth Brundle is the inventor on the brink of perfecting his “telepod”, a d-mat booth that will allow him to avoid motion sickness. In trying to impress a reporter, Ronnie, he reveals too much, and enters an arrangement wherein he will allow her complete access to the imminent breakthrough, provided she holds off before releasing the story until he is ready. Once again, early problems are overcome, leading to the first human test—on the inventor himself, plus the obligatory stowaway fly. Cronenberg’s reconceived machine operates as a gene-splicer rather than a Frankestein-esque surgeon, creating a hybrid “Brundlefly” that at first appears perfectly normal and only slowly reveals the fact that it has been invaded on a cellular level. As the Brundlefly loses fingernails and other non-fly parts, he becomes aggressively hyper-stimulated, driving away Ronnie, who has in the meantime become his lover. She has problems of her own to deal with: an invasive ex who is also her boss and the discovery that she is pregnant, perhaps to the Brundlefly. She kills the creature Seth Brundle becomes after an ill-fated attempt to dilute the fly part of his nature by fusing what remains of him with Ronnie and their unborn child—an attempt that leaves him part telepod and part flesh, giving the man-fly-cat hybrid finale of the original story a “cyber” twist, thus updating the fear of invasion (by any corrupting signal carried by an increasingly intrusive media) to one of invasion by deconstructed machines thrust upon us by other machines (via a similar mechanism). Cronenberg intended the gradual transformation of Seth Brundle into the Brundlefly as a metaphor for ageing and death. At the time, it was read as speaking to the AIDS epidemic. Old age, death and disease are all perfectly natural processes, like sleep, and yet at their heart lie existential nightmares. Mutation, natural or unnatural, biological or technological, is far more than skin deep: change changes us in ways that are hard to explicate or predict. That this anxiety is widespread would be an understatement. (Promotional material for the remake advised viewers: “Be afraid. 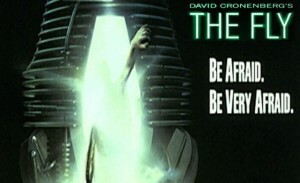 Be very afraid.”) Cronenberg’s reiteration of the story was one of the most successful movies of 1986. In 2005 The Fly was listed in Time magazine among the top one hundred greatest movies ever made. It turn generated another sequel, The Fly II (1989) and an opera composed by Howard Shore, composer of the Lord of the Rings scores, premiered in 2008. Interest remains in more sequels and yet another remake. It is easy to see how today, in an age of social media, the internet and body modification, the franchise is considered still very much alive. Further reading: Littau, Karin. “Adaptation, Teleportation and Mutation from Langelaan’s to Cronenberg’s The Fly”. Alien Identities: exploring difference in film and fiction. Ed. Deborah Cartmell, I. Q. Hunter, Heidi Kaye and Imelda Whelehan. London: Pluto, 1999.